Welcome to the 13th edition of the Pyro News. In this edition we'll have a look at using implements to impress wood, and then seeing the results as we burn over the impressed patterns. (I think this technique is not only full of potential, but it's also as easy as pie!) 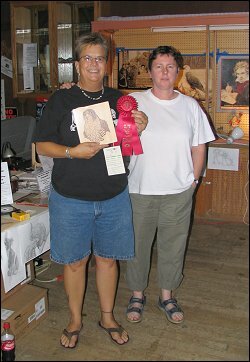 We'll also have a good look at Cheryl Dow's Woodburning Celebration Show in Pennsylvania, America. Plus, I'll be introducing my first DVD lesson. Well, we have a lot to get through in this issue so we'd better get going. 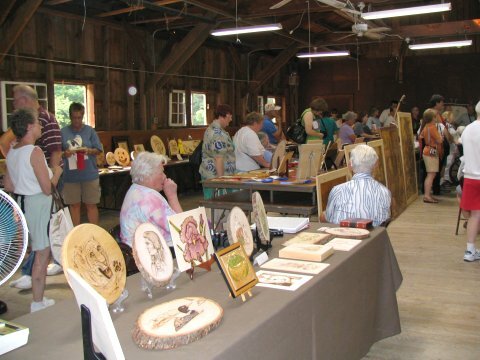 I hope the 'First Impressions Article' gives you some inspiration and that you enjoy viewing some of the great pyrography seen at the Woodburning Celebration. I also hope you had a lovely Christmas and 2008 will be one of your best. If any of you wish to be notified in person when I have supplies, please EMAIL ME and I'll let you know. I like to think of myself as someone who thinks outside of the square�sometimes. In one way I'm very traditional in my artistic tastes�and I do have a great love of realism art, which isn't exactly radical. But I'm a believer that art has no rules...whatever's needed to row your boat to the other shore, is more than okay in my book.. 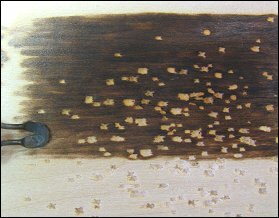 I like to encourage burners who seek my advice to think of pyrography as not simply a hot pen that burns pictures, but to take their machines, their nibs, their hands, their minds and push their chosen medium in as many directions as they can. Doing this can be very freeing as well as a wonderful way to open doors of creative possibility that seemed previously shut. then the surface burnt with a shading nib. Impressions punched with a Phillips Head screwdriver. This reminded me of the 'stars' of the American flag. 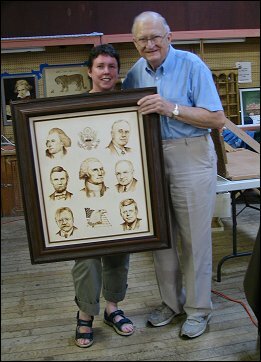 When I was doing seminars at the Pennsylvania show I made 'variety' a theme of my demonstrations. I chose to show some of the ways that I've discovered pyrography can be used...as a stand-alone craft as well as in conjunction with other mediums. I really don't want people to be able to burn in my style�I like to teach techniques and possibilities that they can apply to their own work, their own subject matter� in their own style. then gradient tone burnt over the top with shading nib. Because of the people's reaction in those seminars I thought we might cover impression in this issue of The Pyro News. I have used this technique in the past for various things, like white hair, etc, but its application is potentially much broader than that. I recently spent an afternoon playing with this technique so I could pass on some possibilities to the readers of The Pyro News. Hopefully my little examples here will inspire some of you to experiment and push the boundaries of this technique�I think the possibilities are exciting! - Sue. Branding iron punched into the surface, then burnt. heat to make it slip easily. I used a small variety of tools to make these various impressions. Given enough tools and some experimentation, the patterns that could be made would be virtually limitless. 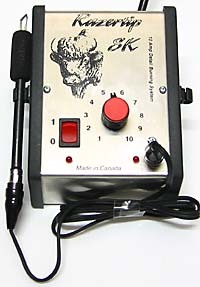 I was thinking that leather embossing tools would be excellent for more fancy/repetitive patterns and initial branding stamps could be used to stamp initials...this would be excellent for signing your name on dark projects. 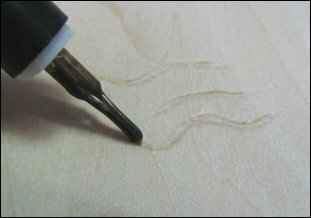 There's no need for pyrographers to search height and low for tools, your basic burning nibs can be used to great effect in this technique. 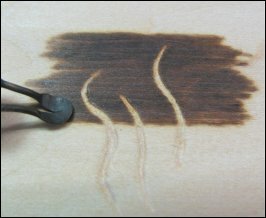 I have found that it's better to have a little bit of heat on when impressing the wood...just enough to help the nib slip along more easily, but not enough to darken the impressed area too much. One word of caution here: make sure your nib can stand up to the added pressure, fine nibs are likely to break or bend. Impressing into the wood with a writing nib. trying to impress all at once will more likely tear the wood. Use a shading nib to burn over the impressed area. Use a light pressure when burning, so you don't sink into the impressed valleys. Think about burning different tones of darkness over the impressed area, not just black. I used basswood to impress into. This had its positives and negatives. One plus is that it's soft and didn't cause much resistance to my 'hand tooling' the surface. The negative is that heavy pressure will tear the wood, so experimentation will be needed to find a happy medium of enough pressure to indent and not so heavy as to tear. 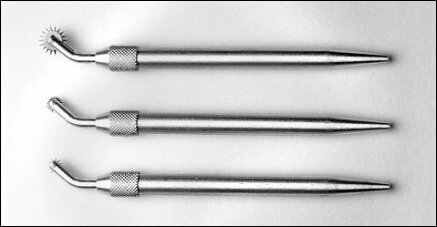 Even though heavier timbers would be more difficult to hand impress, I think they would be more suitable to impress with hammer pressure. The dense fibers of heavy timber would be less likely to tear and the 'branded' edge would appear more crisp. Here, I've impressed the wood with a phillips head. I've then lightly burnt over the top with a shading nib. and then burnt again...this time dark. The result is multi-coloured impressions. Consider burning several tones instead of just two. Consider how difficult it is to burn around small areas. 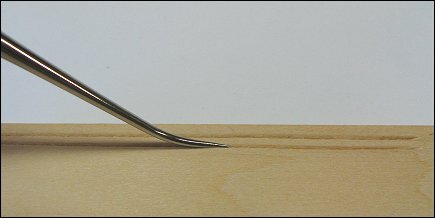 Now, lets see how we can use this technique to put a decorative edge around your work...or around its frame. Here, I'm impressing the wood with a dental pick. gradually getting lower with each sweep. I used a ruler as a guide when impressing the first few sweeps. I then used a shader to burn over the impressions. I tended to burn slightly across the impressions to keep the lines crisp. I then used a fine engraving burr to clean the trenches. You could also use folded sandpaper. The finished result is a crisp, decorative edge. This reminds me of 'V' grooves on picture matting. depicting the mortar between bricks....it worked great! 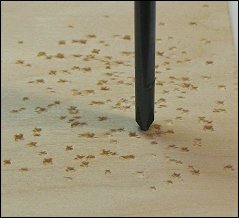 impress these dots along the edge. You could use this in conjunction with a straight line...or in any other combination you choose. 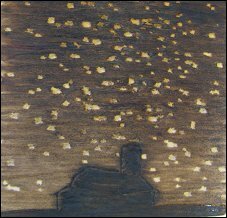 Finishing with the theme of a starry night, I decided to end my experiments with a tiny freehand burning. It occurred to me that you could burn a dark silhouette against a starry sky using this technique, so, I burnt this little barn and silo against a night sky. The possibilities of silhouettes against a sky or window etc, seem broad to me. A buggy cresting a hill on a starry night...trees against the night sky...owls...wolf howling...hey...I just thought...you could even do fireflies! Impress in a random manner. I used 3 sizes of mini phillips head screwdrivers to do this. I started colouring the sky, then decided to burn in my barn. I used a writing nib to burn the dark/solid silhouette. I finished colouring in the sky using a shading nib. I lightened the sky as it approached the horizon. DVD1: An Introduction to Burning - Techniques, Tips, Tricks and Troubleshooting (Approx 20 mins) DVD2: A one on one, step-by-step lesson on burning a Red Tailed Hawk (Approx 85 mins) Including: One hard copy Pattern - One hard copy Texture Map (Pattern showing the direction of flow and length of lines) - One hard copy Finished Picture Both NTSC and PAL formats available. 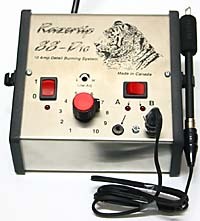 Suitable for all kinds of pyrographic machines. This 2 disc DVD set has been produced because of the many requests I've had to conduct classes. 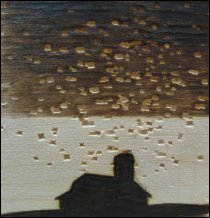 It seems people have been keen to see in person how I approach my pyrography and to learn of the techniques I use. I designed this DVD with that in mind; to have you, the student, sitting right next to me as I instruct you in the burning of a Red Tailed Hawk. But this lesson is not just about burning a hawk, it's about me passing on as much pyrographic information as I possibly can in the 105 minutes allowed. 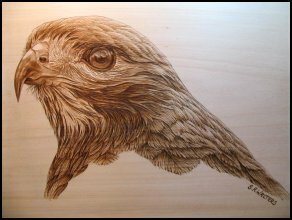 The Hawk is simply a vehicle for us to use as we explore pyrography, step-by-step, together�for you to take away new skills that you can apply to your own burning, no matter what the subject. 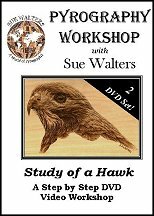 The hawk lesson contains 10 steps and is over 85 minutes long. It also includes special tutorials to explain complex areas in more detail, such as burning the eye. As usual, in my desire to pass on as much knowledge as I can, I decided to include a bonus section called An Introduction to Burning. 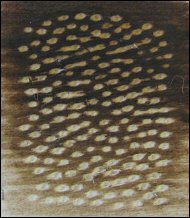 This disc is your reference to sound pyrographic practices and troubleshooting. It's designed to be viewed alone or used as a reference when doing the lesson. The Introduction to Burning is approx 20 minutes long. In it I explain subjects such as: Work Area, Burning Machines, Basic Nib Types and Their Use, Tips for Better Burning, Preventing the Dreaded Blob, Burning Even Lines, Nib Speed, Nib Pressure, Drawing Continuous Lines, Blocking in Dark Areas, Burning Tone Using 3 Methods, Erasing Mistakes, Nib Cleaning and Maintenance, Health and Safety, Preparation and Transfer. Finally, included in the DVD pack are one hard copy Pattern, one hard copy Texture Map (Pattern showing the direction of flow and length of lines) and one hard copy Finished Picture. 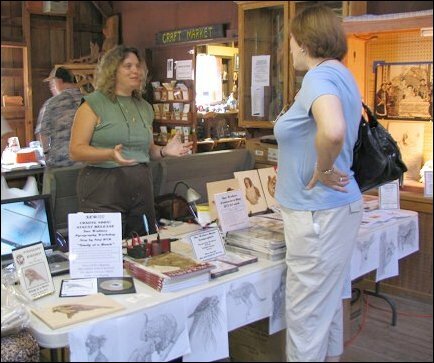 What a wonderful time I had at the 2007 Woodburning Celebration, in Cook Forest, Pennsylvania. It was my first trip into the United States, (apart from being in transit when flying), and I enjoyed every moment of it�well�apart from the dread I get when I have to speak in public�but that's another story. After a few misdirections, we arrived at the house of our lovely hosts, Cindy and Bill Ban. We were warmly welcomed and I was soon in the pool, enjoying a dip and getting pretty excited about seeing fire flies�which we don't have in Australia. (Yep, I really must get out more...) Before long, dear Cheryl Dow, (the show organizer), and hubby arrived and we all chatted the night away before hitting the sack for a much needed sleep. 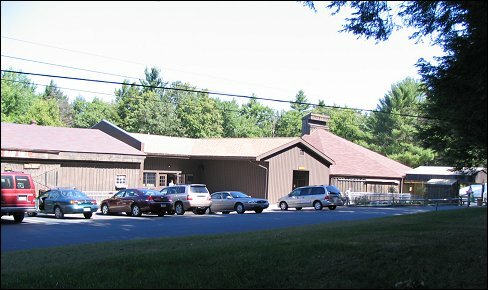 The next day we drove to the Cook Forest Sawmill Center for the Arts to set up our booth. How great it was to meet so many people I've only written to, but have never seen! Of course, there were people I had already met, like mates Dannie, Pat & Anne, but I also got to meet people like the extraordinary Kathleen Menendez, (IAPA co-founder), the famous Orchid Davis, Don Worden, Bob Morris, Pat Sheridan and Dave Sanderson�.all wonderful. (If I've missed any names, please forgive me!) Then, as that day and the following progressed, people would come by to introduce themselves�and it was amazing because I knew the names well from emails exchanged, or by seeing them on some on-line group or another...it was a treat! Then I also got to make friends with a whole bunch of new people�too numerous to mention. Many of us would head off to share a meal after the show and I spent many entertaining hours chin wagging with old and new friends�and putting on weight�holy moly, those Americans know how to feed a girl! Anyway, to all I met there, thank you:) I enjoyed it immensely and have come away with many warm memories of our time spent together. 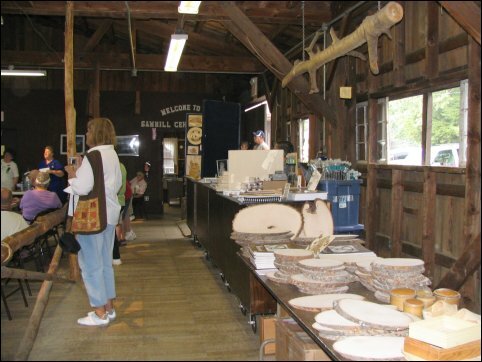 The setting was an old sawmill, full of antique, rustic character�perfect for a pyrography show. The competition itself was truly outstanding! I was greatly impressed, not only by the quality of the entries, but also by the numbers, (over 200), and the diversity of burning. I have to confess, the quality really did impress me�and surprise me. 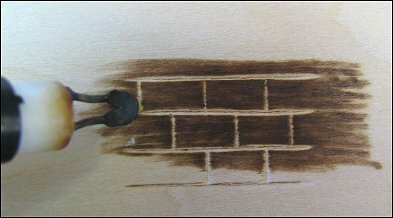 It really is evident to me that the pyrographic community is growing rapidly in technique, numbers and originality. It used to be that we'd mainly see the same patterns, the same subjects, the same style� but not any more�and I, for one, am very pleased about that. It's proof to me that we are finally starting to look outside the square�to push limits�to explore all that burning can be. It's exciting! Please CLICK HERE to view the gallery of pictures. View of the competition area, over 200 entries! My thanks also go out to Cheryl Dow for putting on such a fine show...to Brian Brubaker for helping me out so well, (nice guy�I owe you a beer)�to Cindy, (great sense of humour) and Bill Ban for putting up with us while I became waterlogged in their pool� to Dannie, for watching my booth and being a good mate�to Nancy Rung for a lovely meal, theatre tickets and the humongous telly�to Frank, for his support and help�and to my best mate, Barb Kaminski, for once again being the rock of support in all my endeavors�thank you. 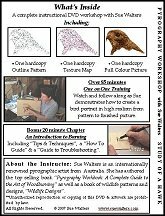 I'll finish my memories of this trip by relating the experience of meeting two contrasting pyrographers�they each taught me lessons well learned. One is Shenna Shotwell. Shenna is a novice burner and I will never forget how thrilled she was at competing and surpassing her wildest expectations by winning two ribbons at her first showing. She seemed to me to encompass what many beginners must feel�the desire to create, but also the fear to put themselves out there. 'Am I any good? How do I compare? Will I look silly?' I got the distinct impression from Shenna that the joy of creating is the most important part�that anything else is gravy. Her happiness at a little gravy reminded me of why I love doing art�that I love doing it for how it makes me feel�for the challenge within myself. It's not about how well you do in a show�for pats on the back�it's more about the personal challenge�a hurdle overcome�a technique mastered�about leaning more from failure than success�about not expecting reward, but humbly celebrating it if it comes by. It's about the journey, not the destination.